Last week during the Council meeting we had a couple of interesting items that I'm planning on writing about. Council authorized the continuation of the contract with The Impact Group (discussion starts at 1:06:50 into the video). This was a bad decision and I'm going to write more about that. Also, there was an expectation that council would waive the 2nd and 3rd reading of a finance package and that did not occur. As a result we will have a Special Council meeting this Monday at 7:15. I'll write some about that as well. Energy Aggregation is also before the council. There was about a 30 minute discussion that started 26 minutes 56 seconds into the video. Council decide last year to hire The Impact Group to help construct the right message for the tax levies that were on the ballot. Since then they have continued to pay them $4,000 a month. Just before the vote on Monday the City Manager provided a summation of some of the work they provided. I've posted that below. We also heard Council Member Starline read an email that showed that this contract had been used by the City manager to head off questions by Council Member Starline about the process used to search for and then hire the city manager. As someone that has generally viewed much of the press coverage over the past year as being detrimental to promoting the City I would not continue to employ a company whose purpose is to discount the concerns of a member of Council and the public. For instance one of the first items I promoted was committing to build the Fire Station that voters began to fund in 2005 and one that we had already collected $2.1 million dollars before I took office. I advocated getting started on that building and then a couple of days later the City "message" was that anyone that would commit to building the fire station before getting a new tax levy was irresponsible. This message was developed with my position known and then spread without even giving me the courtesy of letting me know before hand. There are many examples over the last couple years where council and staff has embarrassed the City by going to the press to try and counter my attempts to get information out to the public. 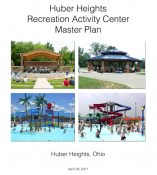 For instance when Council had endorsed staff's recommendation to create a TIF district that would have taken Bethel School money in order to provide more money to build the new fire station, I provided Huber Heights residents a flier with an accurate account of Council's on the record actions. Somehow the press coverage focused on council's censuring me for providing that information. 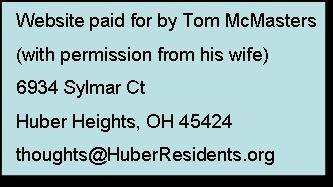 If the Impact Group had done their job the record would have been cleaned up long ago and the residents would be able to go back to those articles and see that I had provided information that exactly matched what was in the official record. Instead, during this November's election the online versions of new articles that came out while we were in the midst of deciding 4 council races all linked to at least 4 previous articles and all those articles contained just enough missing information so that people that decided to go back and read them would likely get the wrong impression on what happened. We can only conclude that the Impact Group either coordinated this, failed to do their job or staff and council ignored their advice. Whatever the case, it is a disgrace that these current council members voted to continue to employ a company that is suppose to promote the City's message but instead we end up with press coverage that continues to prevent the kind of discussions needed to promote the best interest of the City. Additionally, the other point I made during the discussion still holds. Yes, if you tell people enough times that they should really enjoy crap eventually some of them will adopt that position too. On the other hand actually providing a service gives people the opportunity to see progress. This council had a choice spend $48,000 on advertising or spend that money on a pickleball court or save that money. This council made the worst choice. Concerning the financing of the Carriage Trails Supplement. Council expected to waive the second and third reading of this legislation but did not have the votes the other night to pass that motion. Council member Starline explained his votes on his Facebook posts. Both he and I don't believe the City should be providing these supplements. I caveat my objection. I've ask for over two years to be shown that the numbers work in the City's favor. I called this special meeting instead of forcing five council members to do it because at this point we are in a position where it is very iffy if the city could get out of the contract for these supplements and I believe we will save money financing sooner more than later. As far as energy aggregation look to the video for that discussion.